Barring ‘Baahubali’, Megastar Chiranjeevi’s comeback film ‘Khaidi Number 150’ crossed the collection records of all previous films and minted a total share of Rs.110 crores including overflows. 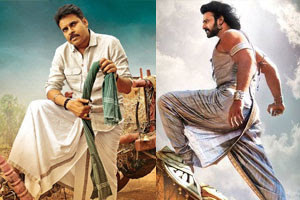 And now, Power Star Pawan Kalyan’s ‘Katamarayudu’ happens to be the highly awaited film of Tollywood. This film has carried buzz in such a way, the teaser was viewed by 80 lakhs netigens which turned as the new record among South Indian films. If the film gets its hype and hoopla sustained, the movie will surely break the records of ‘Khaidi Number 150’. If these predictions come into reality, troubles will surely be started for ‘Baahubali 2’. But why? As of now, no single calendar year witnessed three films getting the statuses of industry hits or second biggest grossers in Tollywood. Let’s hope the convention is broken by these three big films this calendar year.